When you have only two hands, you need something that will allow you to transfer additional tools. And when you have a lot of tools a backpack rescues you, because it holds a lot and protects your back from heaviness. But using a backpack is not such a simple matter, as it seems to us. It is a whole science or even art, especially when it comes to packaging. Therefore, I take full responsibility and want to tell you absolutely everything you need to know about the tool backpack and its setup. Why do you need a tool backpack? The reason why a backpack is a magnificent invention of mankind lies in its size and shape. It is a bag with a lot of capacious pockets and two handles that are installed on the shoulders. Thus, the backpack makes our hands free and gives us the opportunity to move around, use the phone, climb the ladder, row paddles and much more that both hands require. A backpack is a favorite thing of people of those professions that are associated with a lot of diverse tools. If you meet a person with a backpack on the street, be sure that he/she is a mechanic, electrician or carpenter with a belt or bag and has many tools on the back right now. Generally, a backpack is necessary in order to do a few things at the same time – to carry weights on your back and do something with your hands. 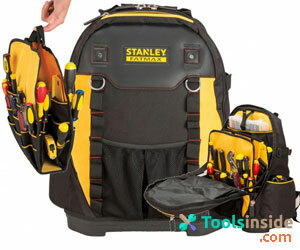 However, the tool backpack is also a specific thing, due to not all tools can be there. So, if you are going to pack a drill or chainsaw, then stop it. Simple universal tools can be in the backpack such as a hammer (or several different sizes), a knife, hoses, and cables (away from the knife), chisels, batteries, screwdrivers and so on. It is no secret that many mountaineers store their equipment in the backpacks since it is more convenient to climb in the years. 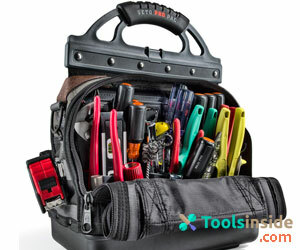 Therefore, tools like those of a climber can also be in the tool backpack. How to pack a tool backpack? We have reached the most important secret, of which nuances are known not for anyone; it is about how to properly pack a tool backpack. It is important to note that the packing of tools in the backpack is divided into three stages. The first stage is a package of bulky tools at the bottom. Then follows the packaging of the middle, where still solid, but not so large, tools are placed. From above you can put lightweight or the same large objects e.g. drill machine, drill bits, socket set, die set that you may need at any time. In addition, there are two additional stages – packing pockets and overlapping points for small items. So, let’s start in order. By the principle of folding the pyramid toy, you put large outboard tools down the backpack. These tools are not of importance and you will not need them until you arrive at your destination. Some people prefer to fold down optional lightweight tools, such as a box of nails. People do this to create a depreciation for the back. At this stage, you pack tools that you might need.It can be as dense as the tools below but have a smaller size. Here you can place a first aid kit, battery, roulette and so on. Here you put all the most necessary tools. Let it be pliers, scissors, a light, or a rope – all depends on where you go with your tools. It is not a constant, but many backpacks are similar to each other. So many backpacks have a standard set of pockets – on the lid, on the sides, and in front. If the pockets are large, then it definitely has small pockets inside itself like a kangaroo. As a rule, carpenters, and mechanics place in the pockets of the backpack not children, but tools of necessities. These can be gloves, goggles, headlights, water, snacks and so on. How to lift a loaded backpack? Now when you packed everything, it remains to set up your loaded backpack and it is not at all easy. Most people make a big mistake. They pick up the backpack while holding the shoulder strap. Doing so, you break the belt and complicate the installation of the backpack on your back. Do not do that! First, loosen all the belts to the maximum level. After that, tilt the backpack and set it to the upright position. Stand next to the back of the backpack, legs straight and bent knees. Now grab the backpack for the traction belt that small that is located between the shoulder straps. If the backpack has an impressive weight, then first lift it to the hip, holding the backpack for a split second. Further, push your hand into the shoulder strap and throwing back the backpack, push the other hand. When the backpack is on your shoulders, just fasten the seat belts that are on the shoulder straps. I want to give you some tips before you buy a backpack that will help you setup it correctly. If you are in search of a backpack, check the inside of the backpack and pockets for roominess and durability. However, if you already have a backpack, you can expand your pockets with fabric, thread, and knife. The material of the backpack should not be gentle, it should be resistant to any weather, especially rainy. In addition, the material must hold a heavyweight, which tools will necessarily create. Distribute weight along the waist and hips. To have enough energy even with a backpack, fill both sides of the backpack evenly. You can be an auto mechanic, carpenter, or climber. Regardless of the scope of activity, you will need a strong tool backpack and an understanding of how to take away all existing tools from hand tools for gas pipelines to ordinary rope or “cats”.